I love telling others about products I love, so today I am sharing about our new water filtration system. When it comes to making healthier choices for our family, sometimes the very BEST choice that could be made is cost prohibitive. In those cases, I try to research if there is a BETTER choice. Such is the case for our water filtration at home. Ideally, I would like to get a top of the line Berkey system with as many ceramic filters as will fit….. but I can’t justify paying that kind of money for the system or replacement filters down the road. So to date, we have used pitcher systems, and for many years a filter hooked up to our faucet directly. I felt like it did OK, I could taste a difference in the water, but it was SO ugly, and took up space in sink area. Recently I was on a Facebook page where tea brewing was being discussed and a woman mentioned that her tea had never been clearer or tasted better since she got a ZeroWater filter. Now previously I have learned that the temp you brew your tea at greatly effects the clearness of the brew, but it also made sense that the better the filter on your water, the clearer the brew would be as well. I had never heard of ZeroWater, so I quickly Googled and saw that they had impressive reviews and claimed to produce water that had 0.00 TDS (total dissolved solids) in their filtered water. They even provide a water tester with each unit you purchase so you can see the results for yourself, and monitor your filter until it needs changing. I also learned that they have 5 stage filters, versus typical pitcher/sink filters which are 2 stage. While on Amazon, I saw that they had plastic pitchers, and larger plastic units for your fridge. While I was intrigued, I really didn’t want to take a step backward and start using plastic again. But then, I saw a glass and stainless steel counter top unit. It’s price wasn’t too bad, and it was an attractive unit. So I did more searching and read more reviews. It seemed like this would be a BETTER choice for our water needs. This is a BETTER choice for us because of all the things it is removing from our water, including 99% of fluoride, but there is still some plastic exposure due to the filter being plastic and not ceramic. It is however one of the safer types of plastic. Beyond that, so far I am thrilled. I did test our tap, and sink filtered water, and finally the ZeroWater filtered water. I was definitely impressed! So I tasted it, and I could ABSOLUTELY taste a difference, and it was so CLEAR. I have not had to change the filter yet, but I was happy to see that Bed Bath and Beyond carries them, so I am able to use coupons to save some money on them. All in all, I am so pleased with our filter system. We saved a substantial amount of money over a Berkey system, and I think the glass portion of the Zero Water system is more attractive than a full stainless steel one. And of course the next thing I did was brew a pitcher of tea. How is that for a beautiful glass of iced tea? 😀 The pitcher of tea stayed crystal clear even through the next day, when I finished it . Note: Though I wish it was, this is NOT a sponsored post, 🙂 Also, I replaced the plastic spigot that came with the unit, with a stainless steel version to further reduce our exposure to plastic. I was so excited when my tea arrived today! Some of you may have seen Cathy Zielske’s post on her blog, well I had to give it a try too. I mean come on, two of my favorite things, right? Cathy Zielske and good tea. So I had to give it a try, and the company offered a 5 dollar off promotion, so I totally couldn’t resist. Well my order arrived today and I could NOT be more thrilled! I got six samples of tea, and they arrived in the most adorable box, that would be perfect for gift giving. But imagine my squeals of delight when I opened the box to find 6 adorable little tins! Who packages SAMPLES this cute? And the labels? Besides the amazing design, each one reminds you of the brewing temperature and and time for each variety of tea. Brilliant! So I open a tin, and it is filled to the BRIM with the most fragrant tea, just amazing! So I had to brew a cup RIGHT then. And it was delicious. Truly delicious I really think I am in love. Disclaimer: I was not compensated or perked in any way to create this post, just a thrilled new customer. In my first post about soap nuts I told you a lot about the nuts themselves and pricing information. Now that I have been happily using them for a while, I thought I would share with you a review of sorts. In the laundry, I have been very pleased. I am easily getting 7 washings out of a batch (five soap nuts). I only use cold water, so when I first use a batch I let it soak in a pint jar of hot water for about five minutes, then I pour the water and the soap nuts in the washer. My first batch of concentrate ( a weak one) worked really well for cleaning counters and mirrors, and hand washing dishes. I was not happy long term with the results in the dishwasher. I am hoping to try a stronger solution and see if I get good results, I’ll keep you posted. Soapnuts are not a miracle detergent. Your laundry will not appear any cleaner than before, just clean. I still use an oxygen bleach like Oxiclean with each load. Soapnuts are not a stain remover. Stains especially greasy ones, require pretreating. Soapnuts have sweet smell to them, and the wet clothes from the washer will smell like them, but when dry, there is no scent, just clean and fresh. There is very little sudsing with soapnuts, but if you take a peek in your washer while it is agitating, you will see it working. I have been reading quite a bit about soap nuts around the internet. Many of the blogs I read deal with natural, frugal living and that includes making home made cleaners. One of the most popular tips I have come across is making your own laundry detergent using borax, washing soda and a bar of soap. Now, there are concerns that the borax isn’t really healthy to be using either. You can read more about borax concerns here and here. Here is the company I have chosen to purchase from, after reading many reviews on the Internet. NaturOil I have no experience with the company other than what I have read on blogs I frequent.I first read about them here at Passionate Homemaking. The writer has used other brands including the Maggie’s brand, but prefers the NaturOil, saying the are a better quality product. They sell a different variety, and the photos on their Amazon listing do look fresher than other photos I have seen. However In the interest of full disclosure, she is an affiliate for them. But she is also a godly woman and I trust her recommendation, and am happy to help her in her frugal journey. It is my hope that I will be happy with the way that soap nuts clean, enough so that it can replace all my current cleaners. If it does, I will be buying in a very large quantity to help get my cost under 10 cents a load of laundry. Not as cheap as the home made laundry soap, but within an amount that my husband and I are comfortable with. Additionally, we use cold water to wash and I have read that can extend the life of the soap nut even further. If you have read this far-THANK YOU, 🙂 I am really passionate about finding things to use around my home that are not harmful to us or our pets, and using something of God’s creation I think is even more exciting. 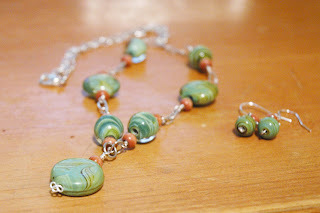 At Christmas time I sent my husband a link to this gorgeous necklace I found on Etsy, it is from Bead Jeweled Designs. My sweetie bought it for me, but when the seller got ready to ship it, there was some kind of a problem with one of the stones, and she wanted to redo it, but it wouldn’t be ready before Christmas. No big deal, hubby told me that I was getting it, so I was happy. But because my husband was such a nice guy, she threw in a pair of earrings for me as well. Wasn’t that incredibly sweet of her?